Outlined at right is what one senior McGill official described as my "checkered career." At one point when I was feeling under utilized and under appreciated, I asked for a raise and permission to explore newly introduced interactive video technologies. I thought that one might be able to carry on a conversation with someone appearing on a computer screen. The raise was refused, but as a consolation, I was allowed to play with what was seen as a silly idea. That project led to my being asked to be part of a new research group in the Faculty of Music. When I was reluctant, they promised it wouldn't last long. Thankfully, they lied. Some of the projects are described below. The Simulator allows students to practice their negotiation skills while trying to sell a commuter aircraft to the Vice-President of Olympic Airways in Greece who appears on screen and talks to the student. The student selects a reply from a menu. It has been used in a number of university MBA programs in Canada, the U.S. and Australia. The initial version was made in 1992 before MPEG video compression (currently mp4) became available. Video was stored on large 12" videodiscs and input to a computer which overlaid graphics on the video. The Simulator was subsequently updated as video technology improved. Located in the McGill Schulich School of Music's Centre for Interdisciplinary Research in Music Media and Technology (CIRMMT), the Group was mainly concerned with co-presence, the feeling that you are sharing the same space with others who are at a remote location. In addition to being the Coordinator for the projects listed below, my role was the acquisition and display of panoramic high definition video. 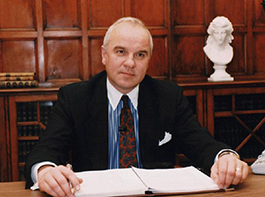 Wieslaw Woszczyk, professor of Music, was responsible for the very high quality surround audio. Jeremy Cooperstock, professor of Computer Engineering, was responsible for the control software and the rapid transmission of the video and audio over high bandwidth networks to the far end. There were also major contributions from many colleagues and contributors, to say nothing of the programmers, technicians and graduate students who did the heavy lifting. An early project addressed the shortage of sign language interpreters for medical appointments and procedures. 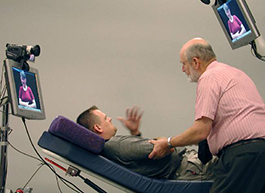 It simulated a medical examination of a deaf patient by an orthopaedic surgeon with the interpreter being located at an interpretation centre in a remote city. The interpreter appeared both on a screen at the foot of the bed for the patient and on another screen at the head of the bed for the surgeon. 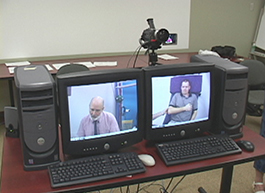 The interpreter could see both patient and surgeon simultaneously. My role was to design the screen and camera arrangement which was awarded a U.S. patent. In addition to transmitting high quality video and audio, this project added vibration data so that an audience in one city could see, hear and also feel the vibrations created by the music being performed in another city. 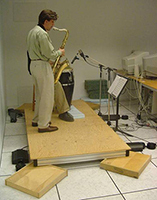 This emulates a jazz club where the music is not just heard, but also felt through the floor. Vibration platforms were used to pick up vibrations from the performers and reproduce them at the far end underneath the spectators' chairs. The project used high speed transmission of panoramic video, surround sound, and vibration data to teach music students at McGill and the University of British Columbia with the instructor at one end and the student at the other. In this case, the UBC end was moved to Seattle for the 2005 SuperComputing Conference with the instructor, Gordon Foote, on the conference floor teaching a student jazz ensemble at McGill. 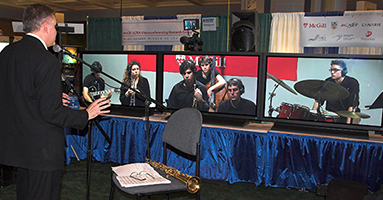 As part of the Bandwidth Challenge competition at the Conference, Gordon and the students played together demonstrating for the first time that it is possible for musicians to play together across the continent, without the use of synchronization devices, if the networks are fast enough. The system won the Most Innovative Use of New Technology award. It has not been possible to play together over even greater distances due to limitations imposed by the speed of light. The project used panoramic video and surround sound to enable a student alone in a rehearsal room to have the experience of playing in an orchestra. 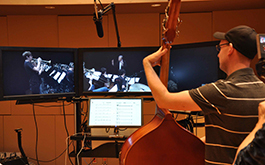 On the left, a double bass player sees what he would see at that position in the orchestra and the score appears on a touchscreen under the centre monitor. On the right, the camera rig is recording from the first violin position. A separate recording was done at each instrument position with that instrument not playing. Afterward the system would record the student playing the missing instrument in a rehearsal room. The student could play back his or her performance with or without the orchestra. The recording was then automatically submitted to an instructor in another city for comment. 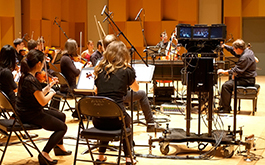 Recordings were done of jazz and classical orchestras at McGill and opera at UBC. For opera, the camera moved as the performer would on stage. 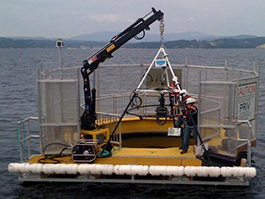 The project was an early effort to transmit broadcast quality high definition video from the seafloor over the Oceans Network Canada undersea internet network connecting instrument observatory clusters designed for marine research as well as earthquake and tsunami early warning. 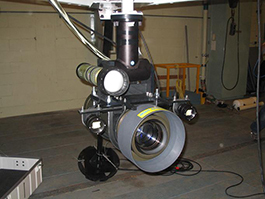 The idea was to transmit video fast enough that scientists at a great distance could control the camera while watching the output. The project was a collaboration between McGill and the University of Victoria. For one experiment, the camera was deployed to study the underwater decomposition of a dead pig, particularly the skin which resembles that of a human body, for use in the forensic examination of murder victims recovered from water. Born and brought up in Montreal. Lived mostly in Westmount, a western suburb, and attended Westmount High. Attended McGill University, initially in Management. Joined the McGill Film Society and was eventually elected President. Despite receiving prizes for the highest marks in auditing, spent more time watching films than studying and was asked to leave. With two others, founded Take One, a Canadian film magazine that was distributed internationally. Sold out my share to finance film production. Produced an independent feature film Rainy Day Woman which received terrible reviews. Hired by McGill in the Instructional Communications Centre, the department responsible for the use of technology in teaching, initially to manage educational films and videos. Studied at McGill part-time, obtaining a B.A. in Film and Communications and an M.A. in Communications. Thesis on the portrayal of Japanese Canadians and Americans in films produced during World War II. 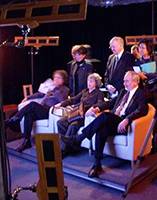 Became Director of the Instructional Communications Centre which expanded to produce interactive teaching materials and become McGill's graphic design centre. 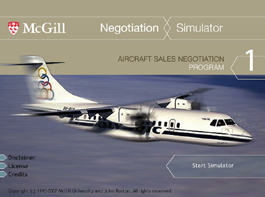 Principal author of the McGill Negotiation Simulator, a highly interactive aircraft sales negotiation. See Research Projects at left. Member of the founding Executive Committee of the McGill Schulich School of Music's Centre for Interdisciplinary Research in Music Media and Technology (CIRMMT). Assumed additional role of Coordinator of the Ultra-Videoconferencing Research Group in CIRMMT. See Research Projects at left. Community activist lobbying for traffic calming measures in community next to McGill. Responsible for street demonstrations and media coverage. Purchased a house in Steveston's Imperial Landing development in 2003. Took early retirement from McGill in 2007 and moved to Steveston. Appointed an Adjunct Professor of Music Research upon retirement to continue research projects involving McGill and UBC. See Research Projects at left. Appointed to the Research Advisory Board of Canarie, an independent body funded by the federal government to manage Canada's next generation internet research network. Wife is a health professional. Worked for several years as a part-time clerk in the Canoe Pass Gallery, a native-owned First Nations art gallery on the Steveston waterfront, until it was sold. Took up billiards and Mah Jong. Appointed as a City Council representative on the Richmond Museum Society Board of Directors. Subsequently elected Treasurer. Block Captain in the Richmond BlockWatch program. Founder and Coordinator of Plug-in Richmond, a group of electric vehicle drivers in Richmond offering information for drivers interested in switching to an electric vehicle as a primary or secondary vehicle. Research activities and Adjunct Professor appointment ended in 2017. Lobbied Richmond City Council to obtain a fair amenity contribution from Onni, in return for Imperial Landing rezoning, to be used for improving community services in Steveston. Details here. Joined Richmond FarmWatch and have been a member of delegations to lobby Richmond City Council, BC Minister of Agriculture and Minister's ALC and ALR Advisory Committee to stop the construction of mega mansions on farmland. Details here. Ran unsuccessfully for a seat on Richmond City Council as an independent after a diverse group of Richmond residents started a petition to convince me to run.